I've lost track with these now and due to having had a week off I'm a little behind in the uploading and sharing of this latest card especially made for the Joy of Sets Facebook group's Christmas 2018 Card Album. This one uses a freebie Sheena Douglas stamp set which was with a back edition of a magazine which I've hauled recently in a little unboxing of a Craft Stash UK delivery. You can see that here. I love the whole traditional theme of this and I really pushed the boat out for myself by using the dotty stamping and the watercolour wash under the car. I'm beginning to get a little bit more experimental, even though I did base this very heavily on a card from the magazine the set was included with. Being relatively new to stamping and card making I'd never thought before of stamping out an image in a different colour, fussy cutting the part out which I want to be a different colour to the main image and just layering it on top of the main image with some mini dimensionals. I'd have been masking off the tree or trying to colour it in green on black... and failing. I like the added dimension it gives to the card too. I also enjoyed being brave and stamping most of this direct onto the layer. It challenged me to be a little more precise. You can see the tutorial in my channel by clicking HERE. Overall I'm pleased with this one. 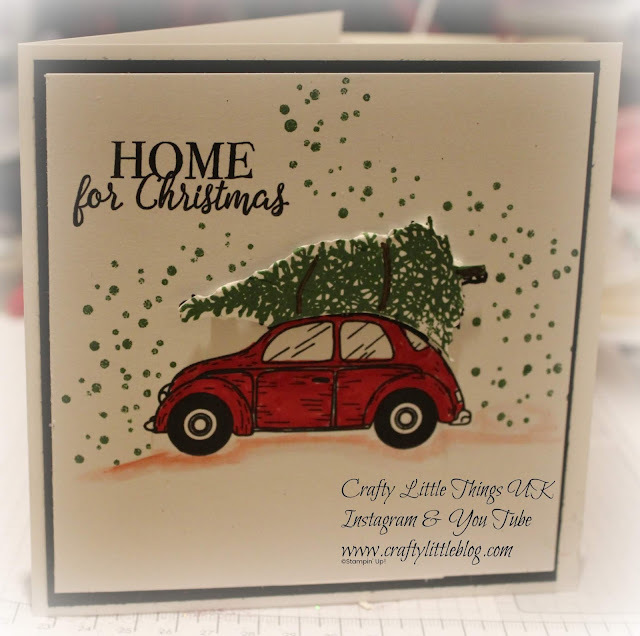 Most of the materials are Stampin' Up! with the exception of the stamp set so are easy to find through your demonstrator. Christmas is almost here! My little break seems to have brought it closer, quicker. Have a great week and thanks for dropping in.